The Pro Evolution Soccer 2015 Demo Database is now available at PES Master. PES 2015 Demo was released for consoles in Asia already, while it will be out official in Europe Wednesday, September 24. PES Master went live earlier this month and already offers both the Pro Evolution Soccer 2013 and 2014 databases in full depth. The PES 2015 database will be updated with the full game closer to the November release. 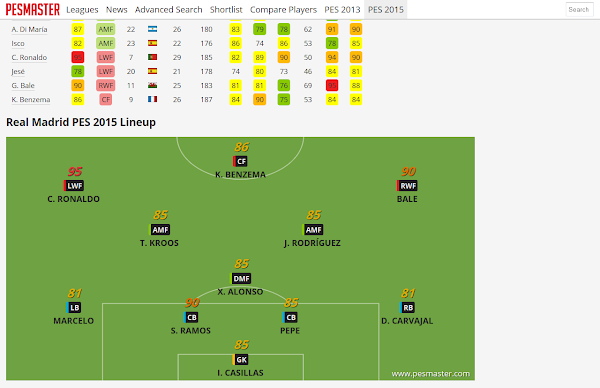 Check out the massively-changed PES 2015 database at PES Master. The PES 2015 Database includes seven teams (Athletic Bilbao, Atlético Madrid, Barcelona, Bayern München, Juvetuns, Napoli, Real Madrid) and 185 players. 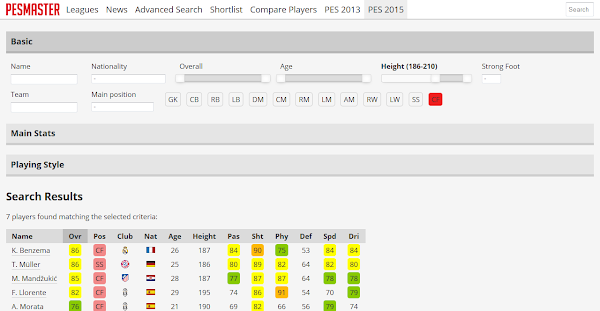 Also try out the new PES 2015 Advanced Search, which allows you to filter the PES 2015 Database by player basic values, stats and player index cards. Cristiano Ronaldo is the highest-rated player in the Pro Evolution Soccer 2015 Demo. 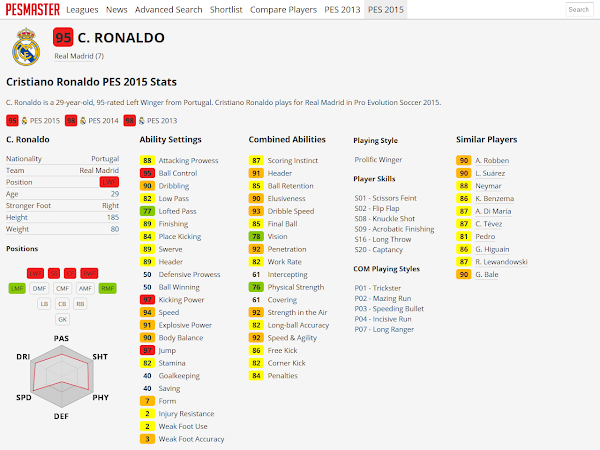 Cristiano Ronaldo has a 95 rating in PES 2015, ahead of Lionel Messi with 94 and Manuel Neuer at 93. Luis Suárez, Gareth Bale, Arjen Robben and Sergio Ramos all have a 90 overall rating in PES 2015. Real Madrid is the strongest team in PES 2015 so far with an average overall of 84, ahead of Barcelona (82) and Bayern München (81). For Pro Evolution Soccer 2015, Konami have yet again made massive changes to the stats system and single values as well. The Tenacity attribute was dropped, while the other abilities as well as combined abilities are mostly the same. For PES 2015 Player Index, the playing styles are the same as in 2014, while there are a few new skill settings in Pro Evolution Soccer 2015. These are the new PES 2015 player skill cards, the respective ingame descriptions and notable players holding the cards.